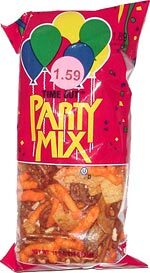 Taste test: This is a good snack mix, consisting of knotted pretzels, stick pretzels, crunchy cheese curls, barbecued corn chips, and small, pizza slice-shaped nacho cheese tortilla chips. The cheese curls and tortilla chips have plenty of good cheese flavor, and the corn chips are larger and fairly flat in contrast to your standard curly Frito, with a good barbecue-type seasoning. There's enough flavor on all of those to balance out the bland but good pretzels. Overall, a good combination. Smell test: Good, very intense cheesy smell. From the package: “Snacks to Enjoy: Nibble, Munch Savor & Crunch!